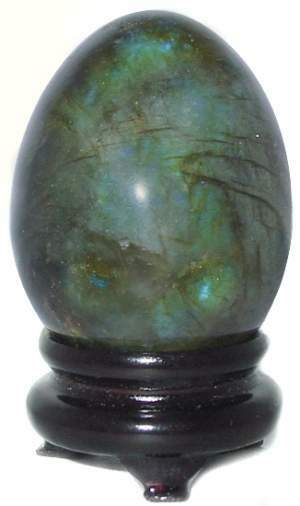 These superb quality Labradorite eggs have great peacock colored fire and flash as well as a nice polish that is unusual for Labradorite. Part of the Feldspar mineral family, Labradorite facilitates change in trying circumstances, plumbing the strengths of the inner self. The Wood Egg Stand is included. sides of the sun and the moon. Labradorite is believed to grant it's possessor intellectual clarity and increased patience, which in turn allows the seeker to reach an inner peace. This mysteriously shiny gemstone is said to help one recognize the crucial "Right Time." It's name is due to the main source for the mineral, Labrador, Canada. It is known by it's fiery iridescence sometimes referred to as it's Labradorescence.